When you hit upon a really good bagel deli, you begin to think why you would select any other venue? And Boynton’s Einstein Bros Bagels at the intersection of Military and Boynton Beach Boulevard is about as good as it gets. Opened at this location almost two decades ago, this popular gourmet haven is undergoing a remarkable transformation under its current owner, Bob Shell. Service is consistently friendly and professional. Although Manager Judy Gutowitz oversees both the back and front end, she doesn’t hesitate to accommodate customers regardless of whether they opt to enjoy the amenities indoor or on the patios. Ask fifty bagel experts what makes a good bagel and you will get fifty different answers ranging from issues of water, heat properties and fuel choices. If you have forgotten you chemistry and physics, you may feel a bit unqualified, but then ask yourself: do you really need Albert Einstein’s IQ to find a great bagel? I think not. My criteria for greatness is quite simple: buy a dozen bagels and then, if you can enjoy two at the outset without any topping, you have found a truly great bagel. As Melvin and Elmo (the two cute guys in the ads) would probably say, Einstein Bros Bagels easily passes the taste test with its twenty six varieties of bagels. Of course, man does not live by bread alone. 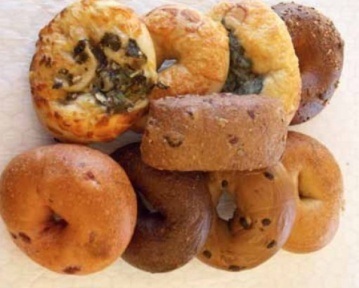 For breakfast, Einstein Bros Bagels has a superb selection of delicious options to enhance your favorite bagel. Nova Lox and Bagel ($6.55) is a perennial favorite. Generous portions of smoked salmon are layered across two halves of a fresh bagel schmeared with one of several varieties of mouth-watering cream cheese, partnered with fresh tomato, perky red onion and tangy capers. Another winner is the Spinach and Egg Panini ($5.55) with its crunchy crust, spinach, smoked bacon, delectable Spicy Roasted Tomato Spread, Swiss and mozzarella cheeses. There are dozens of choices for lunch, ranging from soups, Deli and Signature sandwiches, Bagel Melts and chopped salads. Try the Strawberry Chicken Salad ($5.45) overflowing with tender cuts of filet, strawberries, crasins, almonds and served with a dynamic raspberry vinaigrette. The coffee station has an endless supply of regular, decaf and flavored brews prepared fresh every hour. Take a step up and order a fabulous cappuccino or latte. If you prefer, select one of the classic hot teas or an unbeatable cool smoothie. Don’t move away from the table until you have nibbled on the homemade Cinnamon Twist ($1.29) and the chip infused Coffee Cake ($2.19). Add some hummus, peanut butter and an assortment of signature cream cheeses to your next bagel order. For any professional or personal occasion, Einstein Bros Bagels can deliciously cater your next affair. Call Judy Gutowitz for all the details.